Remember when a cheap $60 wireless router was all your home needed? We were so naive back then. When everything from your phone to your fridge is on your home network, you need a little more wi-fi horsepower. So TP-Link is introducing the first wireless router with blazing 802.11ad. For the uninitiated, the 802.11ad protocol adds yet another band of spectrum in the 57-66GHz range (depending on what part of the world you live in) in addition to the 2.4GHz and 5GHz bands that 802.11ac routers use now. There’s quite a few technical reasons as to why the jump to 60GHz is a good thing, but the most important for the average consumer is speed. The 5GHz band maxes out at 1,733Mbps, but the new 60GHz band can achieve wireless transfer speeds of up to 4,600Mbps. So streaming 4K video without a network cable? Not a problem. 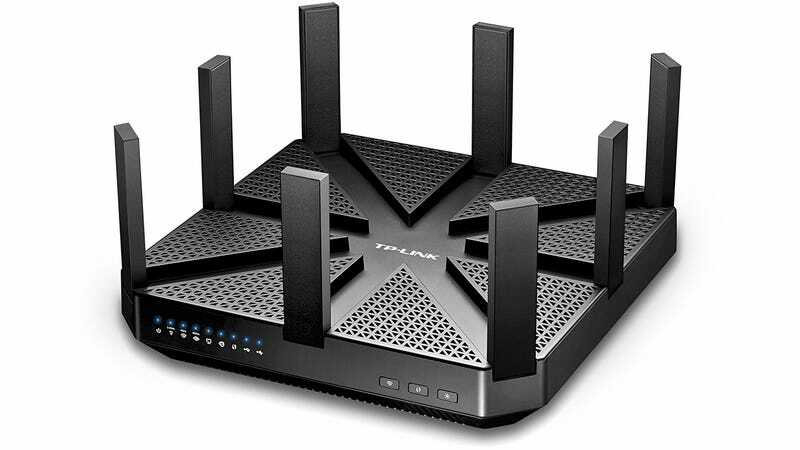 The TP-Link Talon AD7200 Multi-band Wi-Fi Router also features multi-user MU-MIMO technology which helps reduce bottlenecks when multiple devices are actively talking to it, as well as beamforming for improving the connection to individual wifi devices. Eight separate adjustable antennas with powered amplifiers hopefully help the wireless signal reach every last corner of your home, and round back you’ll find four gigabit ethernet ports for easily hooking up gaming consoles and streaming boxes, as well as two USB 3.0 ports for wirelessly sharing data on an external drive. On the software side of things the Talon AD7200 also features guest network capabilities to limit what visitors can access, as well as parental controls and timers to keep your kids from spending their entire childhood online. And this can all be configured from a TP-Link iOS or Android app if you’d prefer the ease of a touchscreen, or can never remember your router’s home IP address. Pricing details aren’t available just yet, but the TP-Link Talon AD7200 should hit stores sometime in early 2016. So if you’ve been mulling over a hardware upgrade, you might want to hold out for just a little longer.